I've written before about my fondness for Adnams beers and I was pleased to see that they were one of the sponsors of the Beer Bloggers Conference. It was during a the registration session, whilst tasting some excellent Tally Ho!, that I got talking to the Sean Clark, Head of Web, about Adnams' new distillery. 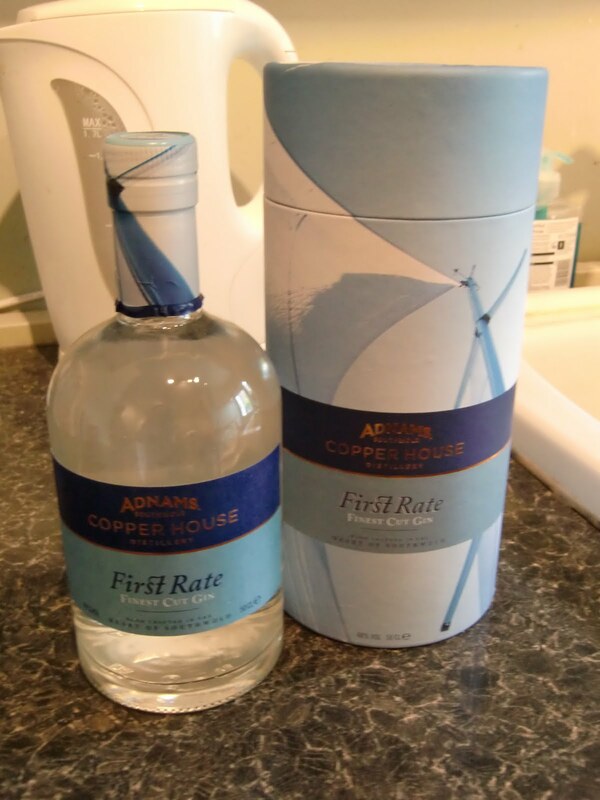 To expand the company's already wide range of beverages into the world of spirits is appealing and exciting one for me and the way that Adnams are doing this seems like a natural progression. The starting spirit is distilled from beer and then redistilled with the botanicals. Sean kindly sent me a bottle of the the premuim gin of the range, First Rate Gin, to taste. I have heard that an Adnams Ale Eau de vie is on the way and I will be getting a bottle of that to try when it's available. So let's review this gin. The 50cL bottle has a great design and I think Adnams are going for "Coastal Quality" with the colour scheme here. The sturdy tube with it's copper lettering makes it a handsome addition to our Spirit Fireplace. It comes in at a strong 48% ABV so it's definitely a night gin1. On the nose there's a little hairspray and a lot of juniper and pine forest. Some aniseed comes also through. It's very smooth to drink with floral and slightly vegetal flavours. There is a citrussy sweetness which gives way to the subtle herbal notes. It is very subtle and at this point I'm concerned that it won't stand up to mixers or cocktails. We used "Naturally Light" Fevertree Tonic Water for this and the gin struggled a little at first. When we ginned them up a bit more the herby and grassiness came through nicely.However it won't be replacing my normal gin choice for G & T because I think it's too subtle. Our first attempt at a Tom Collins with any gin and it's a very nice drink. Again the gin was a bit lost in the mix. What did come though in terms of juniper and spices worked well with the lemon but really not enough flavour power to shine properly. For the Martini I consulted David at Summer Fruit Cup (a great blog which should always be consulted on matters gin) and came to the simple recipe. Four parts gin to one part Dolin Chamberry Dry Vermouth and an olive. Wowsers, my first ever martini and the gin shines.The soft flavours of the Dolin complement the gin's own botanicals very nicely. When this gin is allowed to come through its subtle flavour makes sense and in combination with the clean and understated bitterness of the Dolin, what appeared as muddled and dull flavours before, stand out with an understated savouriness. I liked the martini so much that I followed it up with a version of the martini I have dubbed the Dirty Capertini. Instead of an olive I used three Maltese capers and a splash of the pickling brine. As the caper flavour infuses into the drink it becomes something very special. Try it, you might like it. So in conclusion, I would say that the Adnams First Rate Gin is good for a strong G&T, very good for sipping and great in a Martini. It's too subtle for most cocktails but in it's own right a fine drink. Many thanks to Gin and Crumpets and Summer Fruit Cup for inspiration for my first gin review. Also thanks to Sean at Adnams for the gin. 1. Day or night gin is a category used by another great gin blog, Gin and Crumpets.